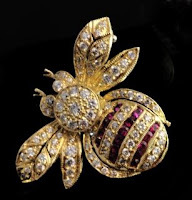 1940's Vintage Bumble Bee Pin of 18k yellow gold and rows of rubies and diamonds. This one of a kind pin comes with an Italian 18k 18" chain. See Jean Agnes' Etsy store.